This area was once a 42-acre tract of farmland owned by the Haubitzer family. In 1899 the National Pigeon Shooters Association bought the property and built a grandstand and casino on the site, calling it Interstate Park. The largest annual trapshooting competition, the Grand American, took place here from 1900 to 1902, but attendance at the yearly event declined as public opinion turned against live target shooting. The event moved to the Midwest, and the park declared bankruptcy at the end of 1902. In 1907 the grandstand was demolished, making way for the development of a residential suburb named Bellaire Park. 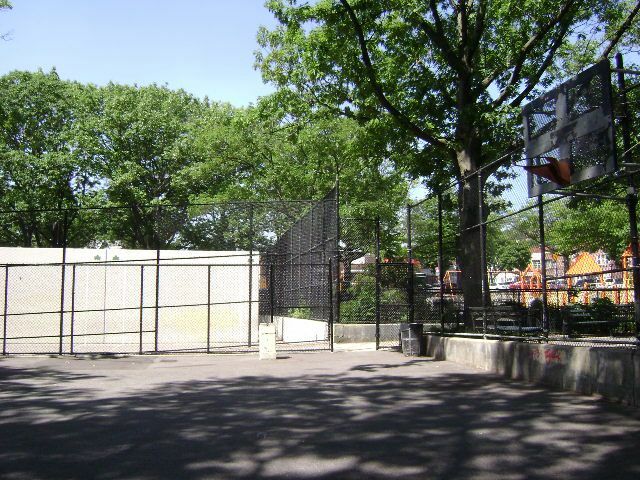 This playground, located on 89th Avenue between 207th and 208th Streets, opened in August 1956 as P.S. 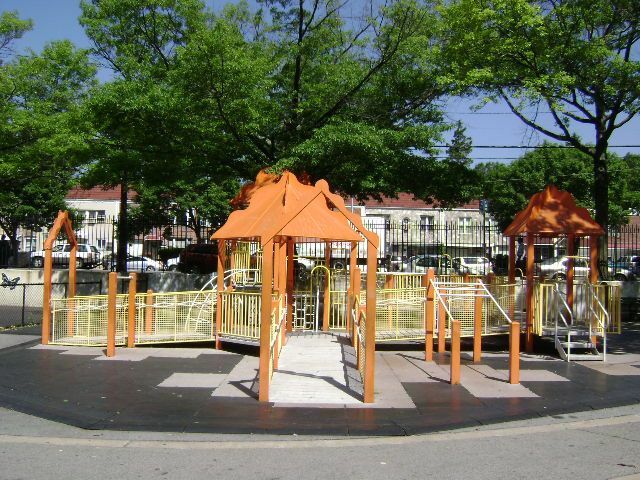 135 Playground and was later named Bellaire Playground by Commissioner Stern in 1985. The site is jointly operated by the Board of Education and Parks. It was built during a rapid expansion in playgrounds throughout the city, guided by Parks Commissioner Robert Moses (1888-1981). Moses was able to harness the massive manpower of Parks, whose ranks had swollen to more than 80,000 workers due primarily to the influx of federal aid from President Franklin D. Roosevelt’s (1882-1945) Works Progress Administration. When Moses became commissioner in 1934, there were only 119 playgrounds in New York City. By 1960, the end of the Moses’s reign at Parks, there were 777. Council Member Sheldon S. Leffler sponsored a $705,000 renovation here in 2000. The refurbished playground contains a full-size basketball court, four handball courts, a comfort station, swings, play equipment with safety surfacing, benches, a flagpole with a yardarm, a spray shower, and caterpillar and butterfly decorations.